Producers don’t typically think in terms of plant population per square foot when seeding canola – but they should, according to industry experts. Autumn Barnes, an agronomist and stand establishment lead for the Canola Council of Canada (CCC), says western Canadian producers typically seed based on pounds per acre, but this method is flawed if growers don’t first consider the seedlot’s thousand-seed weight (TSW). Many Canadian producers still struggle with poor emergence and survivability, and if fields are seeded based on pounds per acre, plant density is much harder to assess. Canola crops are most likely to reach their yield potential when plant density reaches five to eight plants per square foot, Barnes says. These figures are relatively new: until recently, the Canola Council recommended producers target seven to 10 plants per square foot. Following meta-analysis of data including only higher-yielding, herbicide tolerant hybrid canola varieties, however, the Council and experts from the research community concluded that producers should target about six uniform plants per square foot, or between five and eight plants per square foot using an air seeder. Wade Stocker, canola seeds and traits manager for BASF, says extensive research from the company’s Agronomic Services and Product Advancement team, which exists to offer agronomic support specifically for InVigor hybrid canola, suggests the ideal target is five to seven plants per square foot. “A target plant population can help maximize the yield, performance and consistency of InVigor canola,” Stocker says. “If you have plant populations that are above the optimum rate, you get increased intra-crop competition among the canola plants, and this causes higher in-season mortality. Less vigorous plants, or later-emerging plants, will either die or survive and not produce yield,” he explains. Additionally, at high plant populations, canola is more susceptible to lodging, which carries risks for disease and means the crop is more difficult to harvest. With low plant populations – between two and four plants per square foot – weed competition can have negative impacts on yield as well as delayed flowering and maturity, Stocker says. The Agronomic Services and Product Advancement team also noticed less lodging and plant mortality and improved maturity at the ideal rates of five to seven plants per square foot. Both Barnes and Stocker argue that producers should put more focus on understanding plant population, in terms of both plant emergence (roughly how many seeds germinate and emerge from the soil surface per square foot) and plant survivability (roughly how many yield-producing plants make it to maturity on average per square foot) as well as the abiotic stresses in the field that might be impacting these rates. 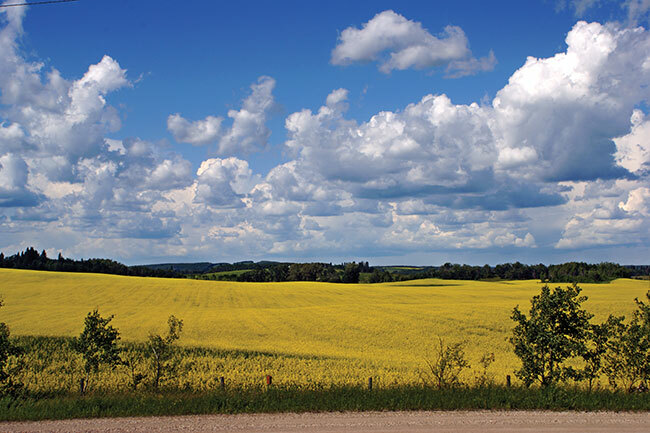 During the most recent Agriculture and Agri-Food Canada-led Prairie weed survey in Alberta in 2017, lead investigator Julia Leeson found most surveyed canola fields had fewer than four plants per square foot. If producers should be targeting five to eight plants per square foot, says Barnes, 75 per cent of fields surveyed were below that figure. Stand establishment is a “messy area” with many factors influencing success, Barnes notes. Producers should assess conditions on their own operations and understand target plant populations rather than looking for specific planting prescriptions. This is the reason industry experts are inclined to offer a range of target plants per square foot rather than one number for everyone. “The best we can do is say, ‘This is a good range for you to be in. Look at your appetite for risk and decide where you want to be in that range. Understand what your target is and know if you hit that target or not. If you didn’t hit it, ask why not? What should I change for next year?’ If you’re not setting your target and measuring yourself, you’ll never know,” she says. Stocker suggests that producers who do not know the specifics of abiotic stresses in each field – amount of residue, low or high soil moisture or temperature, for example – can shoot for planting 10 seeds per square foot, so that with typical 50 to 70 per cent emergence rates under average conditions, they will end up with five to seven plants per square foot. “After your first Liberty herbicide application, when volunteers are eliminated, go out and do some plant counts so you start to understand how many seeds you put in the ground and how many plants you’re getting,” says Stocker. “In an ideal world, you’d go out again and do a stubble count after harvest – this will tell you how many plants you got through plant establishment and how many you lost during the course of the year,” he adds. Good management doesn’t stop with seeding rate, but producers who pay attention to plant population are ahead of the game. BASF is changing to seed count packaging for the 2020 season to assist growers in achieving their recommended target plant population rates. 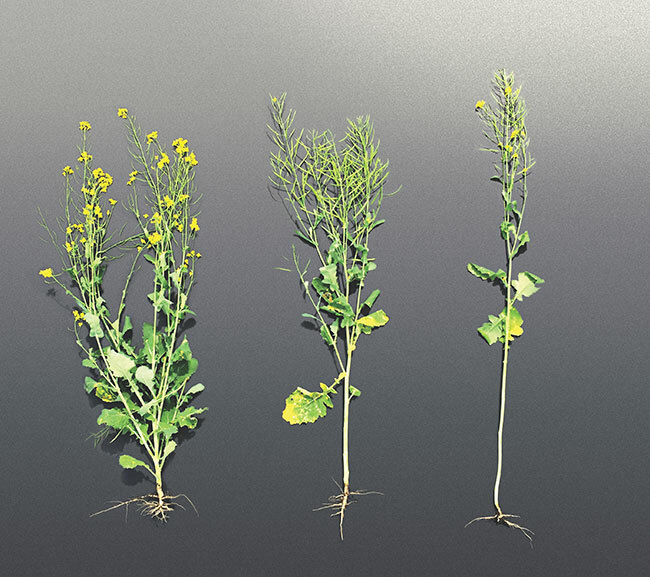 Producers who want to think about plant density before the packaging changes can refer to the seeding rate calculators on the Canola Council of Canada’s website or BASF’s website, agsolutions.ca/InVigorRATE.